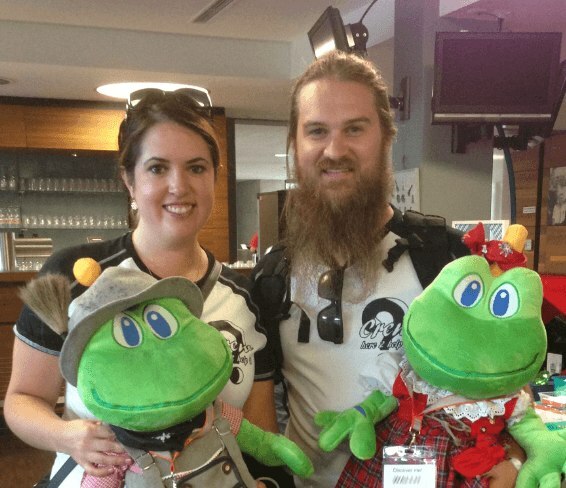 Editor’s note: Geocaching HQ staff are attending dozens of Mega-Events around the world, shaking hands, sharing stories of adventure, and of course, geocaching. 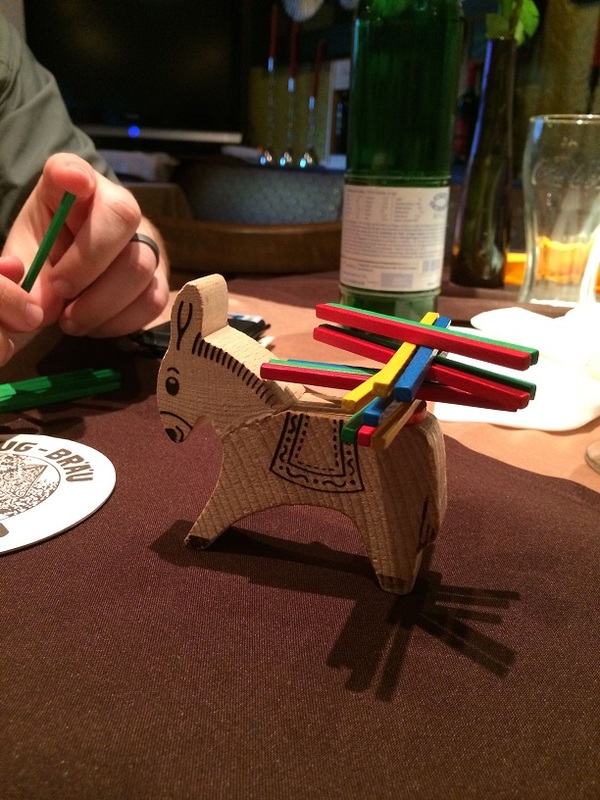 Each person at Geocaching HQ brings their own unique talent to advancing the adventure. Some write code for the website, others design images for the apps, and some shoot videos explaining it all. Justin Dover or dova dov is part of the IT team at Geocaching HQ. This is his Mega-Event experience. 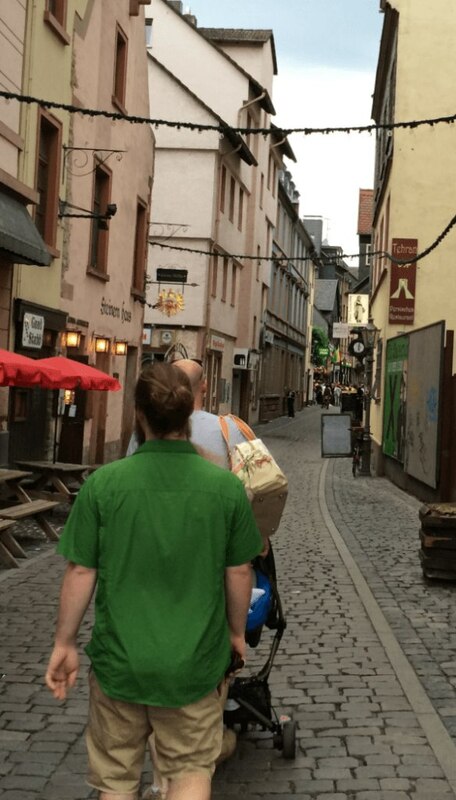 As someone with very little world traveling experience, I was somewhat intimidated when I discovered that I had been selected to attend GC4MEGA Big Äppel. My foreign language is limited to rusty high school spanish and innumerable programming languages that I’ve supported over the years. 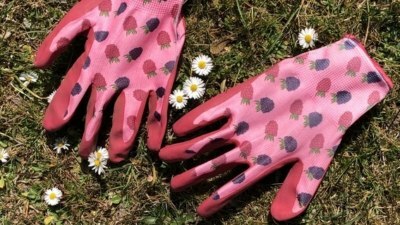 However, any discomfort I had was quickly put at ease when I started communicating with Robert Fitzsch, my contact and one of the passionate members of the Big Äppel Orga-Team. He reminded me that we all share the common language of geocaching. Traveling with my wife Hailee, we arrived in Frankfurt on Thursday and had an opportunity to see the old town area known as Alt-Sachsenhausen. It’s a quaint outdoor setting with lots of bars and restaraunts. This would be the first of many times that we were asked if we had tried der Apfelwein (the apple wine). Consumed during all seasons, applewine is an acquired taste not appreciated by all. I found it palatable, but much prefered the local pilsners. The event was scheduled over two days at Commerze Bank Arena with a conclusion event Sunday aboard The Applewine Express. The main venue was most notably remodeled to support the 2005 FIFA Confederations Cup and the 2006 FIFA World Cup. Friday night hosted the GC4MEET Meet&Greet. 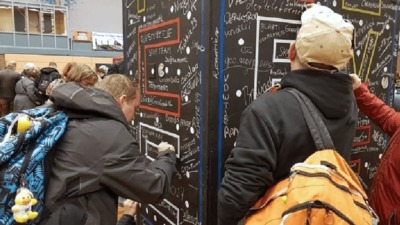 As attendees got a lay of the land and greeted one another, they also had the opportunity to observe two influential geocachers share their craft. 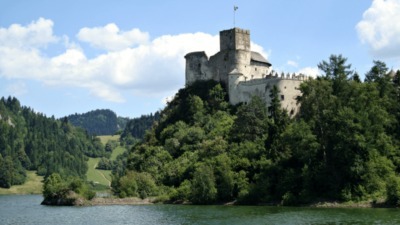 Enno Seifried, producer of a film roughly translated as “Stories Behind Forgotten Walls – The Lost Places”, hosted a viewing which detailed the abandoned locations in eastern Germany that host a treasure of extreme caches. 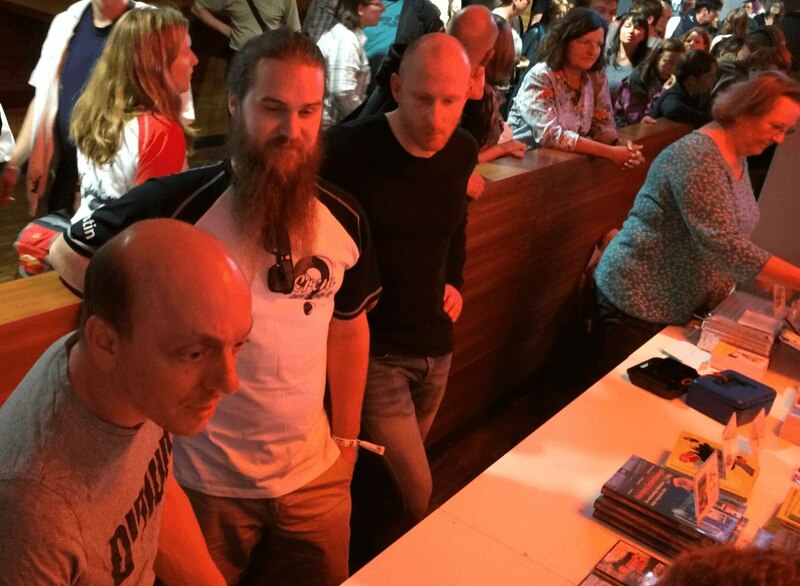 Bernhard Hoeker, a comedian, actor and geocaching author, performed a book reading and signing. 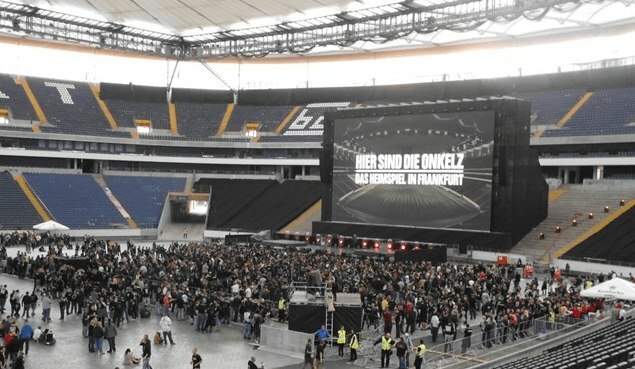 The band Dangerous Comfort was scheduled to perform indoors in the VIP area during the event, however, a popular German hard rock band Böhse Onkelz (Evil Uncles) stole the attention with televised public viewing of their reunion concert in the center of the arena. The concert was taking place an hour south at a racetrack in Hockenheimring, but they sold so many tickets that some of the fans were diverted to Commerze Bank Arena for safety reasons. As a result, cachers were treated to a free suite-level show. Saturday brought lots of activities, with the central geocaching goal of completing the event’s Lab Cache adventure. This incorporated the use of augmented reality, a code emitting wireless access point and deciphering a passphrase on a telephone booth nearby. The Labs series also incorporated published traditional and multi-cache hides to complete the Adventure. 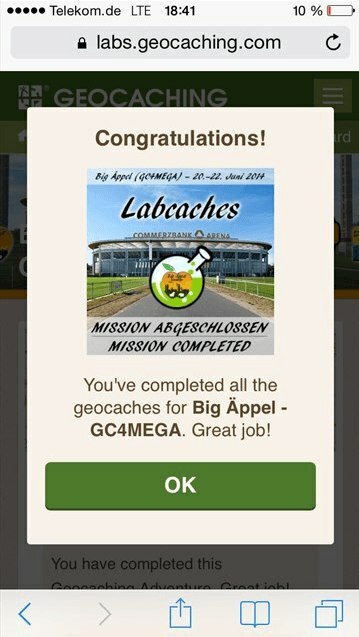 This experience was a wonderful example of how Labs provide the geocaching experience in a small area bending traditional rules and only available for a limited time. When Hailee and I weren’t helping English speaking visitors at the welcome booth, we had an opportunity to walk around to visit with the vendors and presenters. We discovered some unique and clever geocache containers, but we were most impressed with the folks using laser technology to create duplicate low-cost trackables to share. There were also panel discussions and workshops on using GSAK, OpenStreetMaps and Wherigo–as well as a Q&A hosted by yours truly. Once the event started nearing the end of the day, the excitement for geocaching began to shift toward pride of country. As fans began filing into the area wearing black, red and gold, it became quite clear that Germany was about to play Ghana in the World Cup and the venue was host to another public viewing. 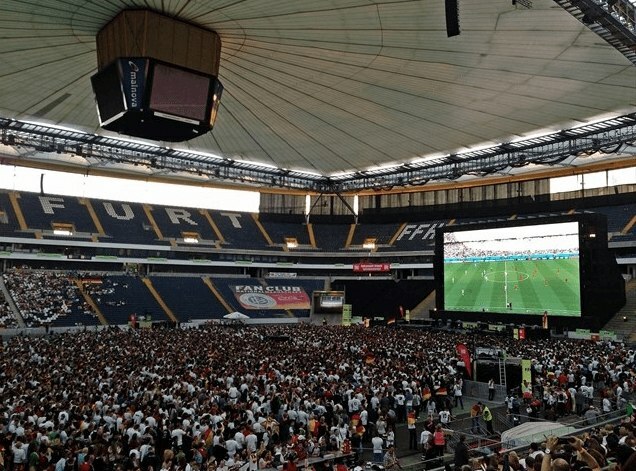 Over 30,000 fans came together to watch Germany on what was advertised as the largest canvas. 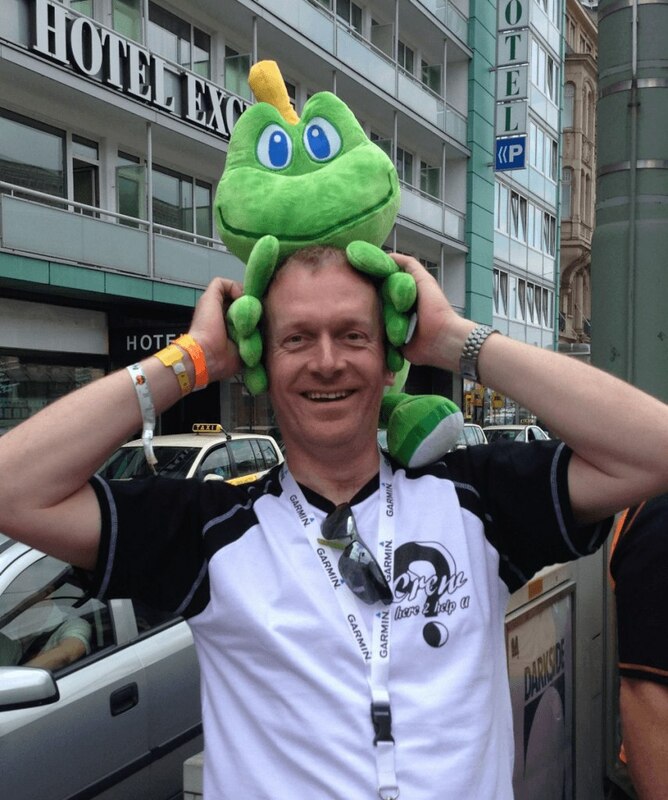 The event officially culminated on Sunday at the Frankfurt Main Train Station with GC4M3ET Big Äppel Bye Bye. It was a trolley tour around Frankfurt aboard the Applewine Express. We had an opportunity to take in the notable sites around the city while enjoying der Apfelwein one last time. 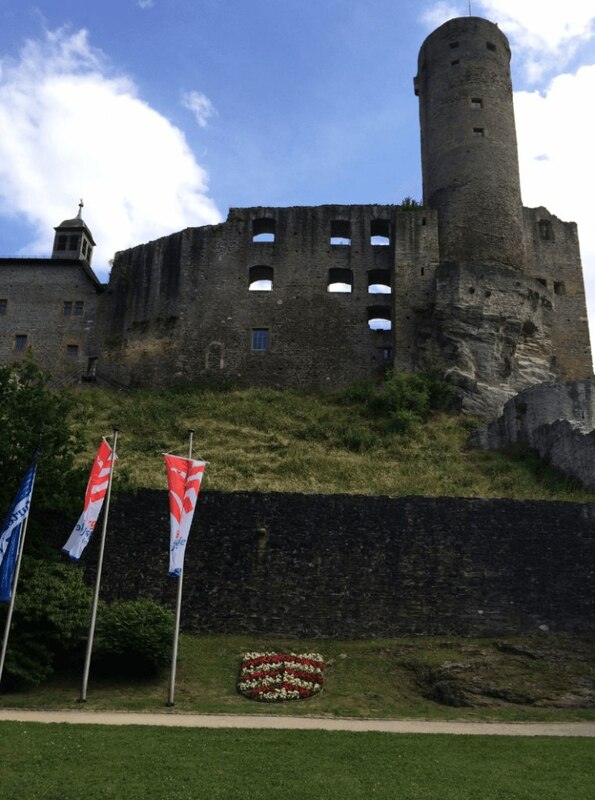 For our final experience of the visit, Robert and Annika of the Orga-Team arranged a tour of Castle Eppstein and dinner in the surrounding town. This was a small event for 20 or so cachers entitled GC4M3GA Meet a Lackey. We had an incredible time touring the ruins, learning of the lineage and counting the steps all the way to the top of the tower. Dinner provided the best meal of our visit and a relaxed atmosphere to discuss common interests inside and outside of geocaching. It was a great chance to make new friends and we even learned a new game. 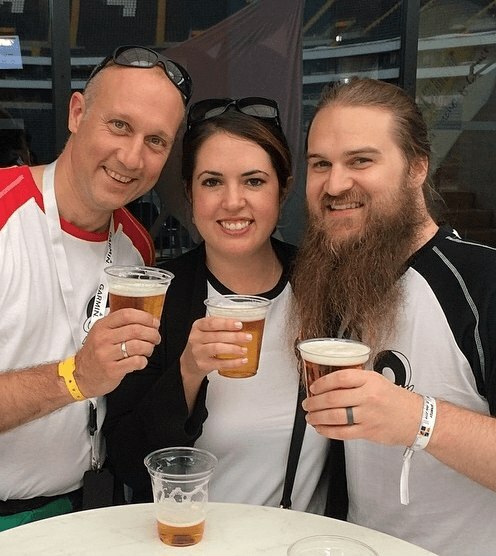 Nicolas, Laporca, takes a break from checking in on exhibitors and vendors to have a beer with Hailee and Justin.